It is really difficult for me to review Alexis Hall's books because they bring all the emotions in me and instead of being objective, my reviews become this rambling, incoherent fangirling. Still, I will try to make this review at least a little bit useful for potential reader beyond the simple and very insistent - Go read this book! It's fabulous! You won't regret it! I really, really like this author's writing style - it's powerful in a quiet way, evocative, often reads like poetry and always speaks to me and moves me to tears both ones of joy and ones of hurt. I love how multi-layered this story is - it's about grieving and bullying and family and identity, and ultimately about change and growth - your past experiences, both good and bad, become part of you, they shape the present you in one way or another. It's beautiful and sad, heart-breaking and optimistic, it brought tears to my eyes every couple of pages or so. It's not melodramatic, but it's even more powerful with its ordinariness. The hurt and pain and rejection and doubt that both Fen and Alfie go through feel real, normal, something that can happen to anyone. I loved Fen, admired his strength to be himself, understood (I think) his sense of loss of identity and direction after his mother's death. But Alfie, oh Alfie was everything to me. His inner struggles to accept, or rather to discover who he really was, what he liked and wanted in life was heart-breaking. Not everyone figures out themselves and their dreams as a teenager. Being older and confused about yourself seems even harder because everybody expects the stage of confusion and figuring things out to be over. One of the things I liked the most in the story was how conceptions about gender identity and sexuality were explored and myths about them were debunked. Ideas of masculinity and queerness were put to the test - liking musicals and flowers does not take away one's masculinity, wanting a long-term relationship and kids does not make one less/more straight or queer. On that note I found some of the conversations between Fen and Alfie about labels and heteronormativity a bit awkward, as Alfie himself said ("I can't tell if it's hot or annoying that you talk like you're on the internet."). I really don't know if people have this type of conversations but it felt odd and too scripted to me. The relationship with family, one's upbringing, especially in a small nowhere town was also a central element in the story. Seeing the people who love you actually hurting you the most by not being able/willing to understand/accept you was really painful to read. Even Fen's father who was Ok with Fen's queerness ended causing him so much pain. This particular plot development towards the end was my least favourite thing in the story. I felt there was no need for it here. 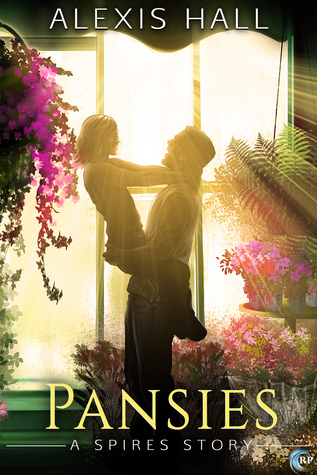 Pansies is beautifully told but also really painful to read at times. It offers yet another in-depth exploration of the complexities of human nature and relationships, just like the rest of the Spires series. If you are a fan of the author or just enjoy heartfelt contemporary romantic stories, I'd encourage you to give this one a try.